Open the E-mail Settings tab. In the SMTP server field, enter a full DNS name or IP address of the SMTP server that will be used for sending email notifications. 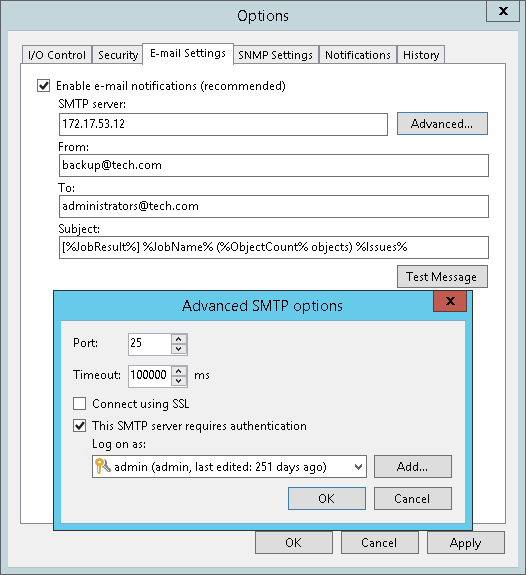 Specify the port number and connection timeout for the SMTP server. To use a secure connection for email operations, select the Connect using SSL check box. If you need to connect to the SMTP server using a specific account, select the This SMTP server requires authentication check box and select the necessary credentials from the Log on as list. If you have not set up credentials beforehand, click the Manage accounts link or click Add on the right to add credentials. For more information, see Managing Credentials. In the From field, specify an email from which email notifications must be sent. In the To field, specify the recipient addresses. Use a semicolon to separate multiple addresses. Recipients specified in this field will receive notification about every job managed by the backup server. You can leave the field empty if required. For every particular job, you can specify additional recipients. For more information, see Configuring Job Notification Settings. If a subject for the email message specified in job notification and global notification settings is different. If a list of email recipients specified in job notification and global notification settings is different. Select the Notify on success, Notify on warning and/or Notify on failure check boxes to receive email notification if a job is run successfully, not successfully or with a warning. Veeam Backup & Replication allows sending a test email to check if all settings have been configured correctly. To send a test email, click Test Message.